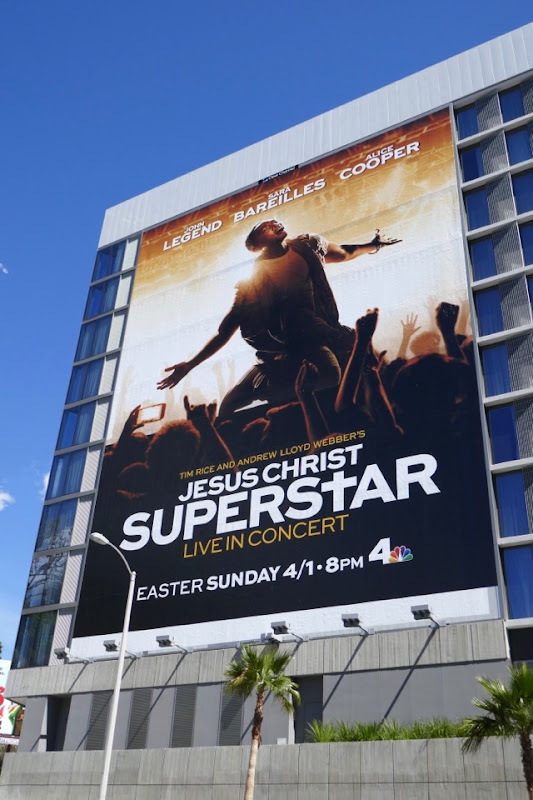 This Easter Sunday NBC has an extra treat to go with all those chocolate bunnies, painted eggs and candy, a live staging of the beloved rock opera, Jesus Christ Superstar. 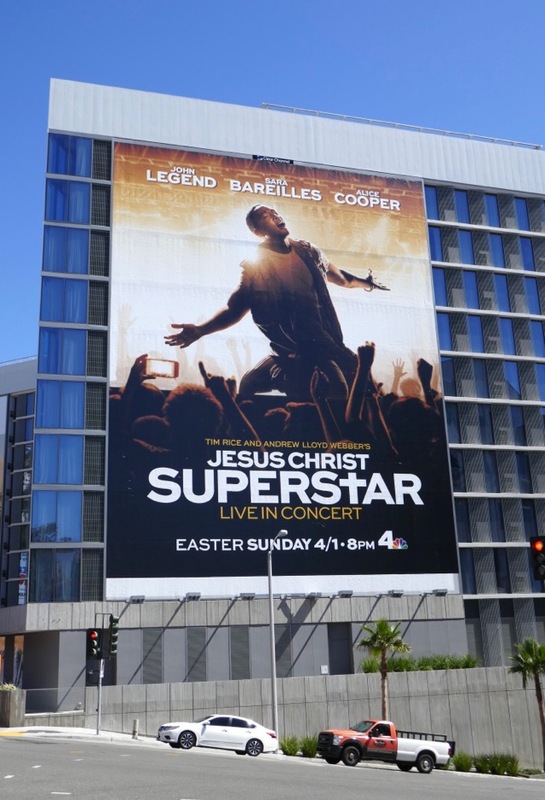 Starring John Legend, Sara Bareilles and Alice Cooper, Tim Rice and Andrew Lloyd Webber's Tony Award-winning musical is brought to life in a spectacular concert performance that follows the final week of Jesus' life, told from the perspective of his infamous betrayer Judas Iscariot. 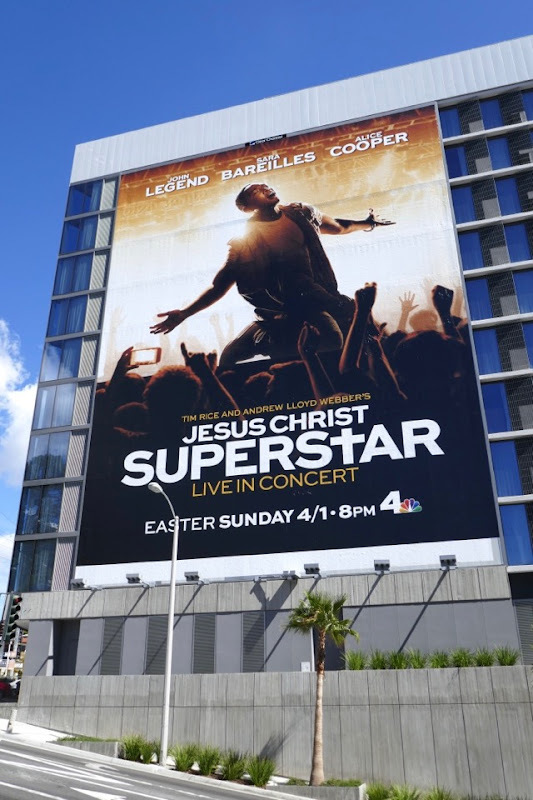 This super-sized billboard for the TV event was photographed at the top of La Cienega Boulevard where it meets the Sunset Strip on March 16, 2018. 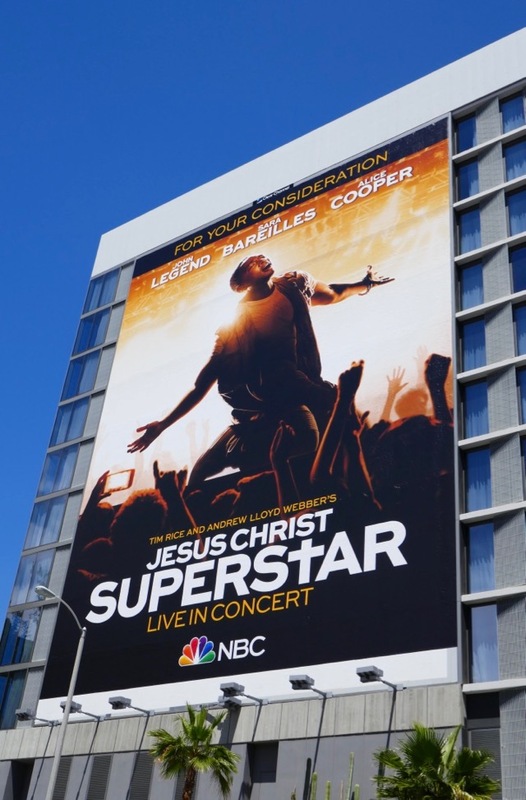 For more of NBC's past live musical events you can also enjoy this billboard for The Sound of Music Live, this billboard for Peter Pan Live, these billboards for The Wiz Live and these billboards for Hairspray Live. 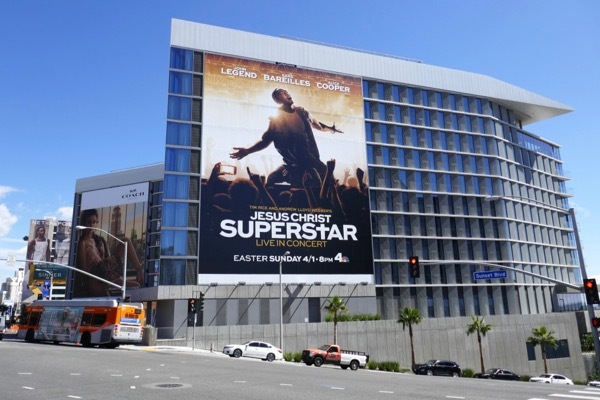 Plus for more ad creatives featuring the Son of God be sure to also check out these Killing Jesus billboards and these Black Jesus billboards. 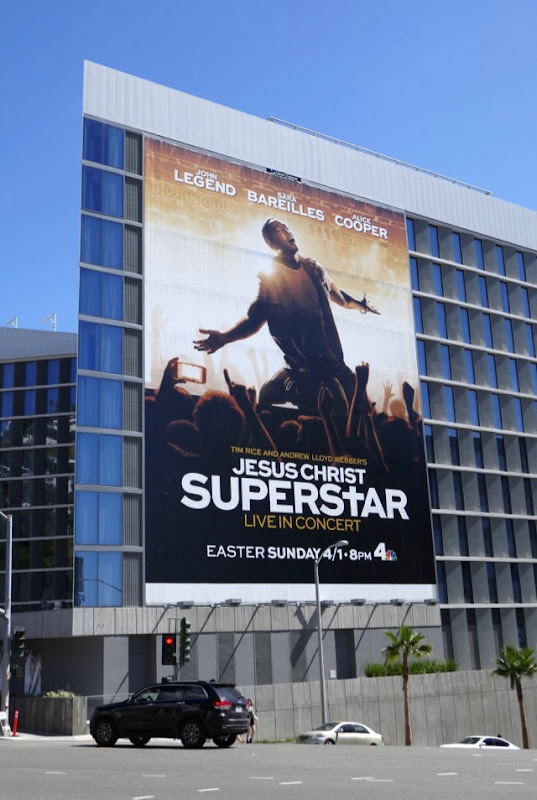 This iconic musical has been performed thousands of times since its 1971 Broadway stage debut, it even spawned a 1973 movie and other film adaptations, but will this new TV broadcast have audiences rocking along at home this holy weekend. 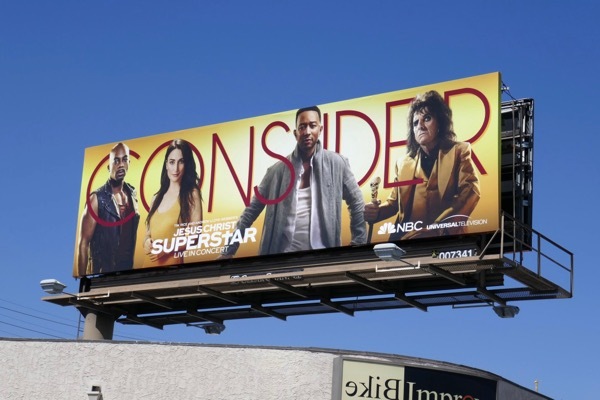 UPDATED: Here's also an Emmy consideration billboard for the musical adaptation with the wider cast, spotted along Santa Monica Boulevard on May 29, 2018. UPDATED: In addition here's another giant-sized Emmy FYC billboard along the Sunset Strip for this live concert spectacular, snapped on June 15, 2018. 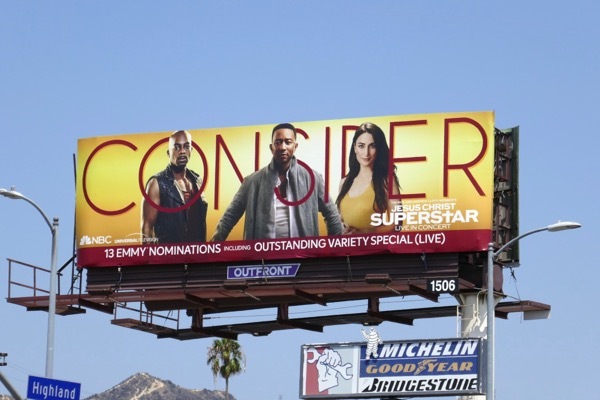 UPDATED: Congratulations to the live musical for receiving thirteen Emmy nominations, including for John Legend for Outstanding Lead Actor for portraying 'Jesus Christ', Sara Bareilles for Outstanding Supporting Actress as 'Mary Magdalene' and Brandon Victor Dixon for Outstanding Supporting Actor as 'Judas'. 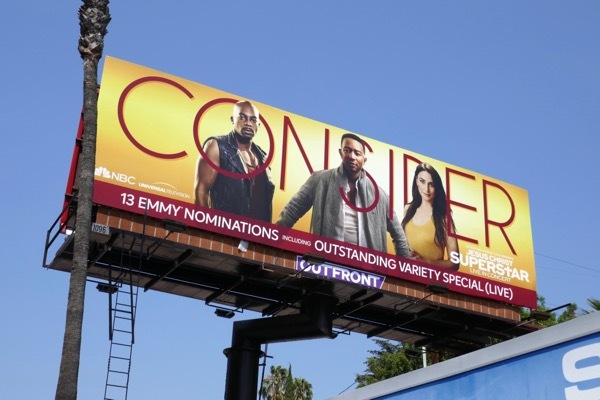 These Emmy nominee 'Consider' billboards were spotted above Highland Avenue and Sunset Boulevard on August 12, 2018.